Puerto Rico native First Lieutenant Ernesto Rodriguez enlisted in the Marine Corps in 2002 as an opportunity to serve, see the world, and better his English. In 2004, the year after the start of Operation Iraqi Freedom, he was married, and in January 2005, his first child, Sebastian, was born. Later that year he was deployed to Iraq. While he loved life in the military with the security and stability it offered, and welcomed the opportunity to put his training to use, being at war limited his contact with his family and he missed them immensely. Having seen other service members watch their children “grow up in pictures,” he was determined not to let that happen to him. In 2009, resolved not to spend any more time away from his family, which now included his daughter, Elsasofia, Ernesto retired from the Marines. Returning home, he found the life he arrived to was not the same one he had left behind before going off to war. His children barely knew him, steady employment was difficult to find, he and his wife separated, and for a period of time he was homelessness. His life was in a tailspin. 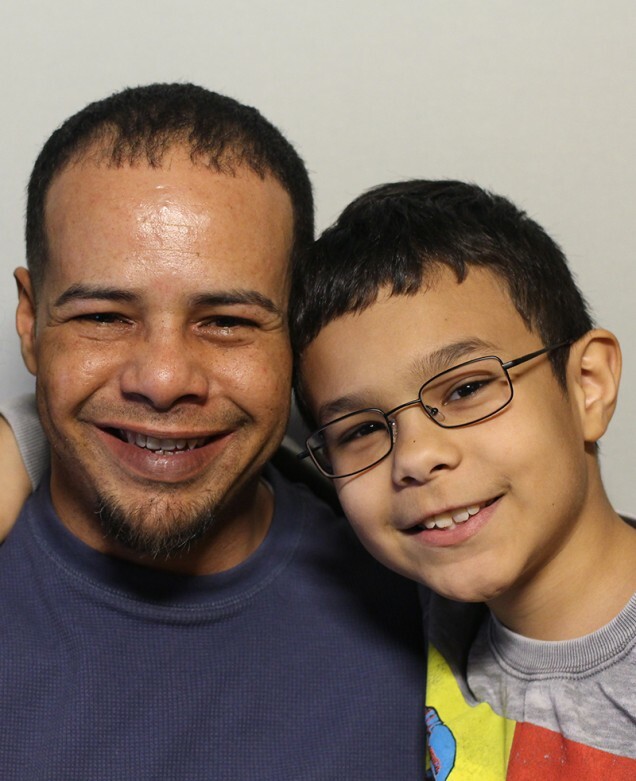 Ernesto came to StoryCorps with Sebastian (pictured together above), 11, to talk for the first time about what it was like for him to go off to war, and his attempts to keep his family together after his return. Originally aired June 17, 2016, on NPR’s Morning Edition. SR: What was it like to go to war in Iraq? ER: I would look forward to be sent over there because that’s the Marine in me. But then, I could be killed. There’s a possibility of me not seeing you guys ever. SR: Did you think about us while you were over there? ER: Every day. When I left, you were just starting to crawl, and then, when I came back, you were already walking and you didn’t know me. You were completely terrified, and it was the…the most difficult part of coming back. SR: Has war changed you? ER: (sighs) That’s another very difficult question. I was hoping to talk about these things with you when you grow up, but yes, war does change you. There was an Iraqi kid about your age, and he was dead. And it could have been you…that kind of thing changes you as a person. SR: Um…why did you have to move into the homeless shelter? ER: When I came back, your mom and I, we went through a divorce, and I didn’t have anywhere to live anymore. How did that make you guys feel? ER: It’s ok, pa. It’s all right. ER: So what does that mean? What is to be a dad mean? This is very interesting. SR: Okay…in school, there is like some thing on like what makes a dad. SR: No, not like a picture. It’s uh, writing. And it says, “God took the calmness of a mountain, the warmness of a sun, and a tons of other stuff, and put it into one together, and called it a dad. You’re just like everything that I would possibly need. ER: Just know that I love you, and that everything I have done is because of you. To see you every day, to answer your questions about life just like we are doing right now, that is to me the most important thing.